Bobbi is the sweetest little pug and full of energy! She has been friendly toward every new adult, child & dog and has kisses for everyone! She loves to hang out on the couch & melts like butter over a little attention & love! She does not like to be isolated if there are others in the house and follows her foster mom everywhere. She has had full run of the house and has not been destructive when left alone. She is still working on potty training but is a smart girl and getting better every day. 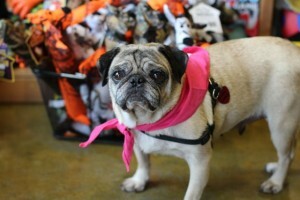 Bobbi will make a great addition to any family that wants to treat her like a princess and make up for many lost years!